With the upcoming 2016 presidential election and the mounting divisions within the Republican Party, the timing couldn't be more urgent for the release of John Paul’s cutting-edge new book America, Cues for Conservatives – How to Engage the Millennial Generation and Unite the Conservative Movement, ($16.49, paperback, 9781498473095; $26.49, hardcover, 9781498473101; $8.99, e-book, 9781498473118), – now available on Kindle and paperback at Amazon.com and other fine book retailers. John Paul, Conservative activist, writer and marketing executive, offers powerful, much needed support of a new brand of political conservatism. He shares his extensive knowledge of American politics, Millennials and his 20+ years experience as a professional corporate marketer to guide a new generation of conservatives to effectively defend and promote conservatism – and fight back against the radical progressive agenda. In brief, America's political future will very soon lie largely in the hands of the Millennial Generation, people born between 1981 and 1999. Millennials are now coming of age and beginning to take over the workforce. Soon they will control American politics, too – leaning heavily toward liberal, socialist and Democrat parties. What will this mean for the future of the country? How can conservatives respond to this alarming trend? According to John Paul, Liberal Democrats have been using a political marketing guidebook for the past 45 years, Rules for Radicals by the late Saul Alinsky, instructing decades of radical progressives about how to use subversive tactics to divide America, take power and gradually implement socialism as an alternative to a free constitutional society. He believes that this has come at a great cost to the country’s unity, culture and spirit, and the Millennial Generation has largely bought into this destructive agenda – often directly against their own best interests. John Paul stresses that if the conservative movement cannot find a way to unite and become inclusive of all Americans for a 21st century electorate, they will be unable to stop the progressives’ march forward. Cues for Conservatives by John Paul is a clear, powerful, and urgently needed response to this dilemma facing the Republican Party of today. It focuses on how the Left has managed to win Millennial voters and other key demographics, and how conservatives can use some of these same methods, in addition to some bold new tactics of our own, to win them back. John Paul’s 12 bold “Cues”, or rules, that all conservatives should live by are detailed, as are strategies to better reach and engage Milennials and all generations of Americans. He reboots and rebrands the GOP as the new “Grand Opportunity Party”, advancing a 22-point party platform that the vast majority of Americans can support. 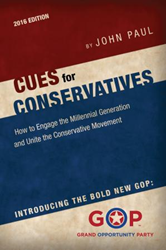 Cues for Conservatives delivers a united conservative response to Rules for Radicals, giving the tools needed to beat liberals at their own game while providing a clear guide to winning a new generation of American conservatives. Liberty Hill Publishing, a division of Salem Media Group, is a self-publisher dedicated solely to protecting and sharing the conservative message. Retailers may order Cues for Conservatives – How to Engage the Millennial Generation and Unite the Conservative Movement through Ingram Book Company. The book will be available online through libertyhillpublishing.com/bookstore, amazon.com, and barnesandnoble.com.